Forecasted to be published at first in French: De l’usage des espaces publics au Caire, Natures jardinières et Centre-ville. The title is temporary, the publishing house still unknown, the year of publication as much, but it is in the course of writing. This volume will be the book completing my work of ethnographic investigation on Cairo, Egyptian capital and Um el-Duniya, “Mother of the world” tell us the Egyptians. 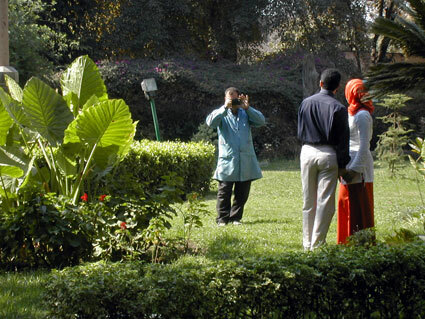 Between 2002 and 2006, I carried out a continuous ethnographic fieldwork on public spaces of Cairo as researcher in social anthropology (or urban anthropology, I had then a position in the CEDEJ in Cairo) by taking an interest, on the one hand, in urban natures (in particular parks, but not exclusively), but also in the evolution of the uses of public spaces (with a detailed attention with the destiny of the downtown area, the wast el-balad). The study especially related to relationships that Inhabitants of Cairo (distinguished in social groups) maintain with their built-up areas, their urban nature(s). I would like to take this opportunity for perhaps endeavouring, modestly, new forms of ethnological writing. I also wish to include in this work a rich iconography (what often alarms publishing houses), not as simple illustrations, but as a real medium of a scientific discourse. The book will probably also want to take stock of the abundant literature with anthropological dimension devoted to Cairo. My sabbatical years in 2006 and 2007 in Paris are dedicated to the writing of this volume on public spaces, the gardens and other natures of Cairo, but also with this other: The space of a nature: Ethnography of the oasis of Siwa (Egypt) [temporary title]. Do not hesitate to leave me your comments, advises, requests on this project (forum below). This article has been read 1255 times. Dernière mise à jour de cette page le Thursday 18 July 2013 à 21:04:51. //// -----> Citer cette page? Vincent Battesti, "Use of public spaces in Cairo, Gardening Natures and Downtown area [temporary title]" [en ligne], in vbat.org anthropoasis, page publiée le 19 July 2006 [visitée le 13 April 2019], disponible sur: http://vbat.org/spip.php?article301.